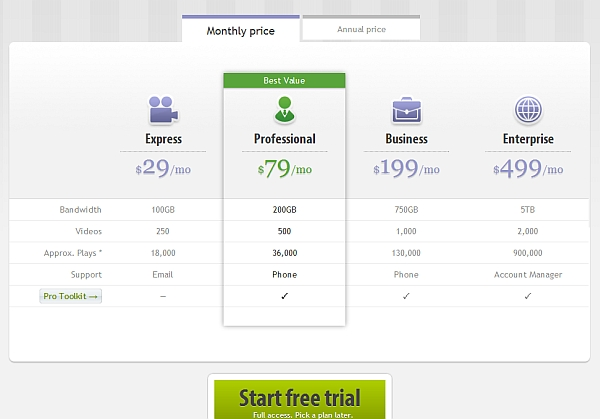 With static pricing, product value outpaces the cost to consumers. 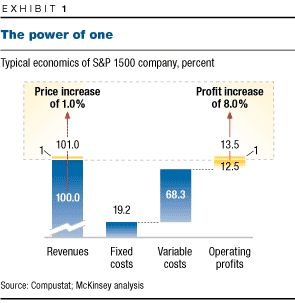 A 1% increase in price can yield an 8% increase in profits, according to McKinsey. Pricing right is the fastest and most effective way for managers to increase profits a price rise of 1 percent, if volumes remained stable, would generate an 8 percent increase in operating profits (Exhibit 1)—an impact nearly 50 percent greater than that of a 1 percent fall in variable costs and more than three times greater than the impact of a 1 percent increase in volume. Price Intelligently recommends one to two price changes each year. A 100% close rate isn’t cause for celebration—it means you’re not charging enough, especially if there’s no pushback or negotiation on pricing throughout the sales process. 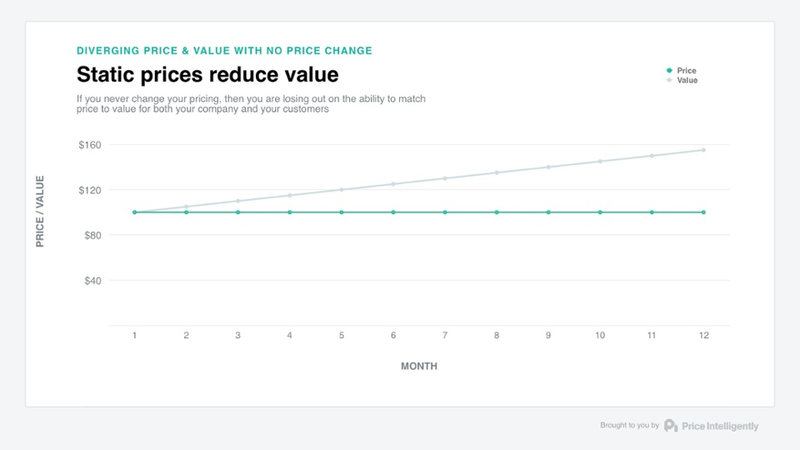 SaaS companies should aim to capture 10–20% of their economic value, a baseline figure of what you may be able to charge if you can demonstrate ROI clearly. For agencies or consultants with limited hours to sell, a price increase can replace older customers with new ones who are happy to pay a higher rate. Here’s how to skip the painful part and get it right the first time. Price Intelligently notes that most companies fall short during the middle phase. Research your past price increases. What happened when you did? How many subscribers or repeat buyers did you lose? 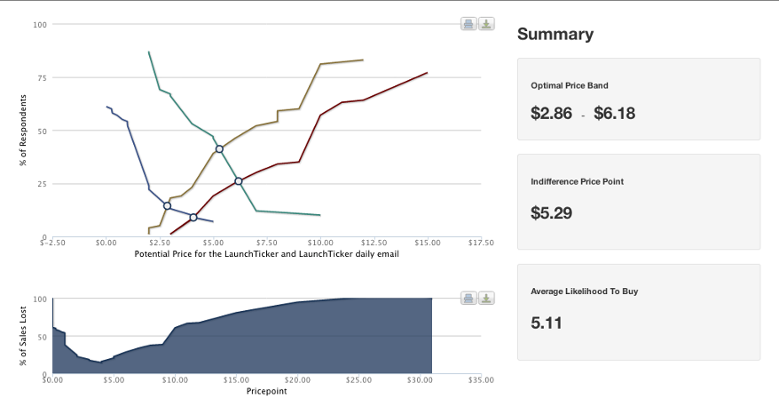 If lifetime value rose and customer acquisition costs decreased, you probably got it right. Compare yourself to competitors. Will a price increase move you into a new tier? Are you a mid-range provider that’s trying to get into the high-end market? You’ll need to adjust your value proposition and communicate that shift appropriately. Ask the right questions. In addition to open-ended responses, you can conduct quantitative research on price sensitivity. 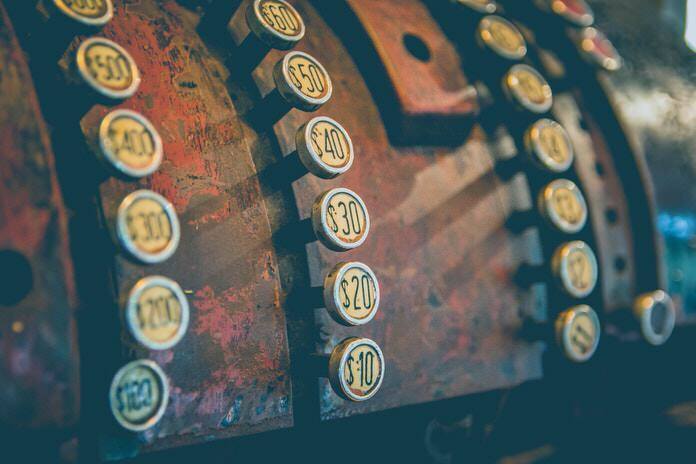 Price sensitivity is a measure of the impact of price points on consumer purchasing behaviors, or in other words, it’s the percentage of sales you will lose or gain at any particular price point. The most common strategy for managing price increases for current customers is grandfathering (changing the price only for the new customers but keeping it the same for your existing ones). Be transparent about why the price is going up. If you feel compelled to obscure the reason—or if it takes thousand-word essays and charts to justify it—that’s a sign you don’t have a strong case. One way to measure feedback is to monitor consumer behavior. A decrease in time-to-purchase or onboarding flows signals a successful price increase. Anyone can raise prices. 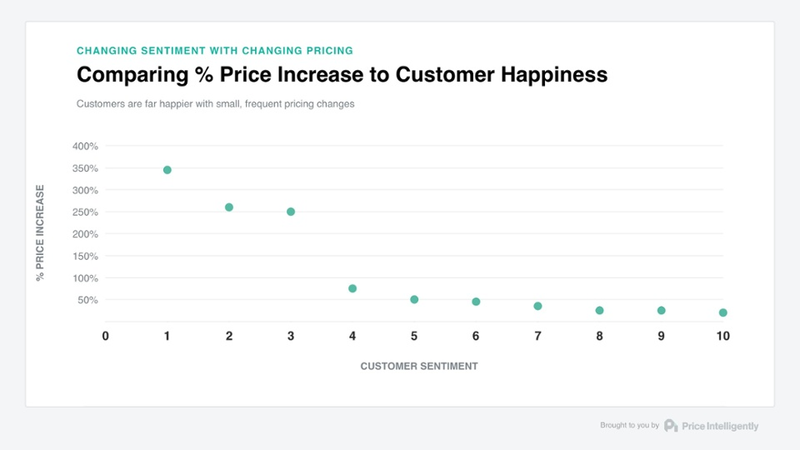 But raising prices and customer satisfaction requires a strong understanding of your customers’ valued features and willingness to pay, which you get from your research.